iKanji touch is the fun and easy way to learn to recognise, read and write Japanese kanji characters. 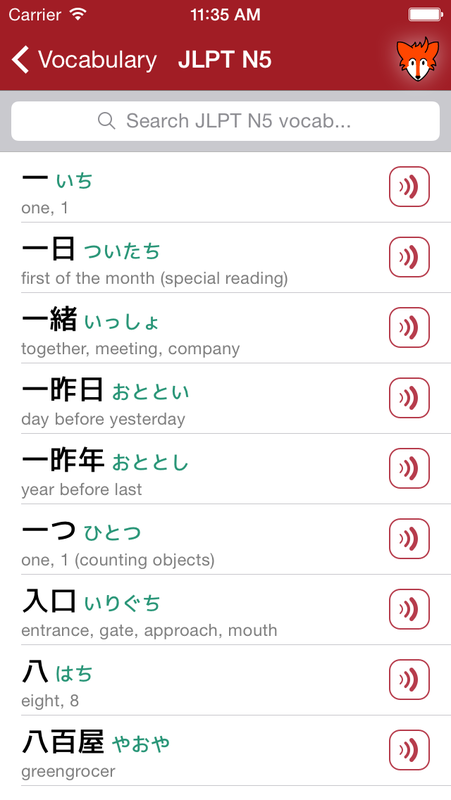 Study on the go with the built-in tests, use the spaced repetition based Teach Me system to learn new kanji and quickly look up characters with the powerful search mechanism. iKanji touch 2 now brings full support for the iPad too! 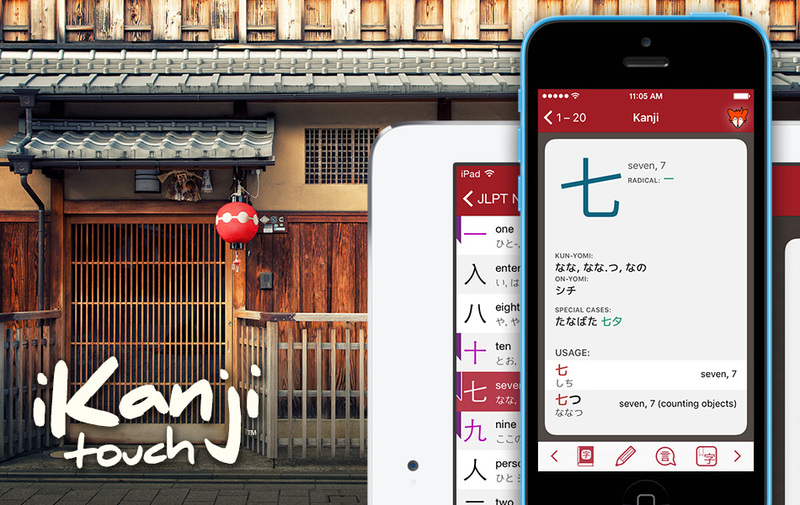 iKanji touch is an extremely flexible app for learning kanji. It’s designed to work well as a reference and as a training and practice tool. The easy to use browser interface lets you quickly browse school grade jōyō and JLPT (Japanese Language Proficiency Test) kanji, perform searches and build your own practice sets. 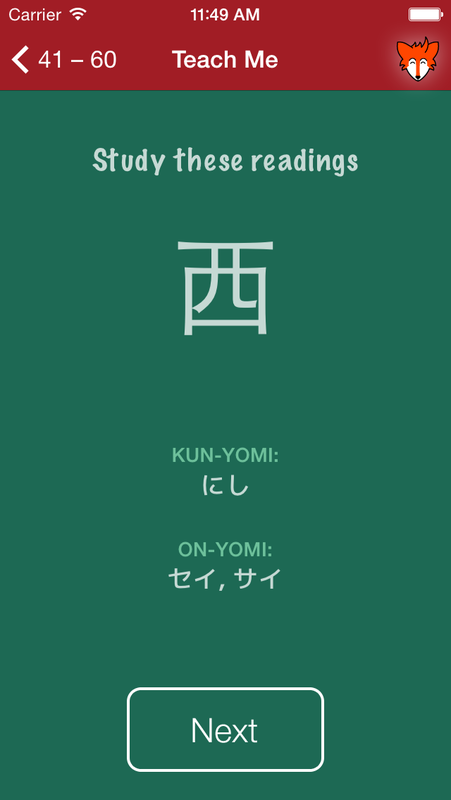 Flash cards show you everything you need to know about a kanji including its stroke order and example uses. New in version 2 is the ability to freely browse and search vocabulary too. 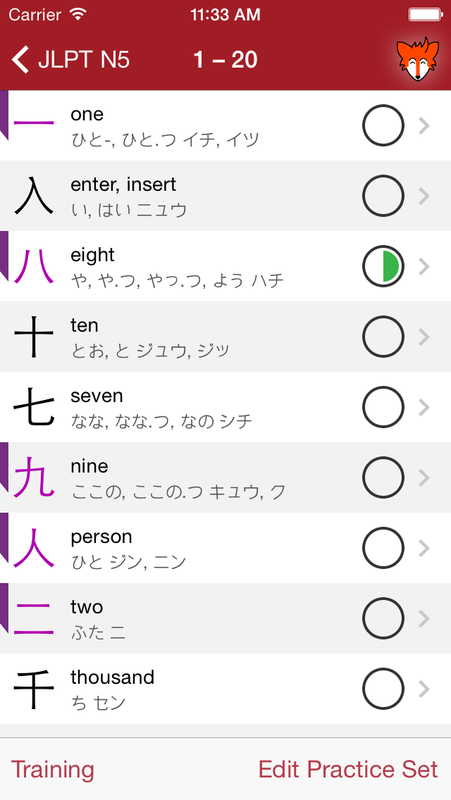 iKanji touch features tests for kanji readings, meaning, stroke order and compounds. You can test yourself on any of these aspects as you like or as part of iKanji touch’s spaced repetition based Teach Me system. 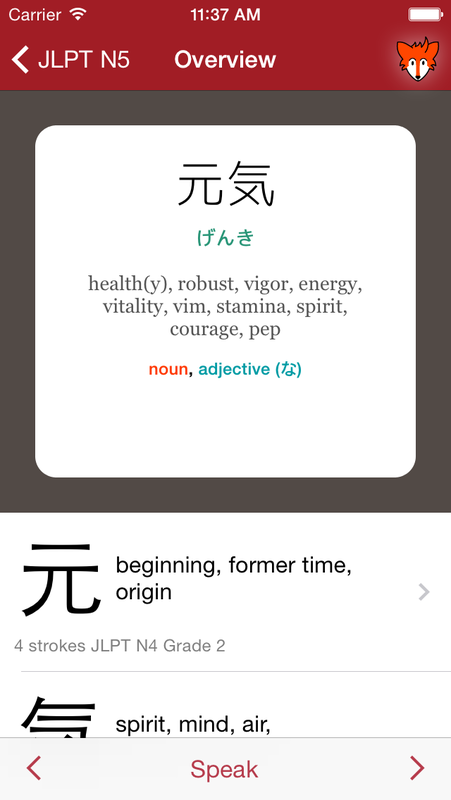 iKanji touch 2 has beautifully designed flash cards that convey all the important information about each kanji. See English meanings, readings, primary radical, example usages and test due date. Then tap to ‘flip’ the card over to see an animation showing how to write the kanji along with the stroke count. There are multiple ways to browse kanji in iKanji touch. The two primary methods are by using the JLPT sets or school grade sets. We’ve subdivided each set into groupings of 20 kanji to make browsing and testing easier. You can also search for kanji and build your own practice sets. Fully supports the iPhone X and all iPad sizes. iKanji touch is self-contained and does not require an internet connection to work. Training progress backup and restore with Dropbox. iKanji touch 2.0 running on an iPhone 6 and iPad Air. 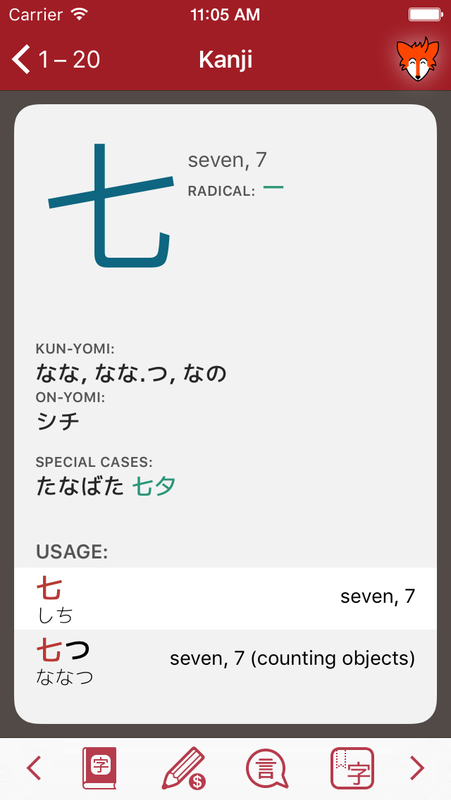 iKanji touch 2 now lets you search for kanji by specifying which radicals it contains. Radicals are the building blocks that make up each kanji, so searching using them makes it possible to quickly find a kanji where you don’t know the meaning or readings. 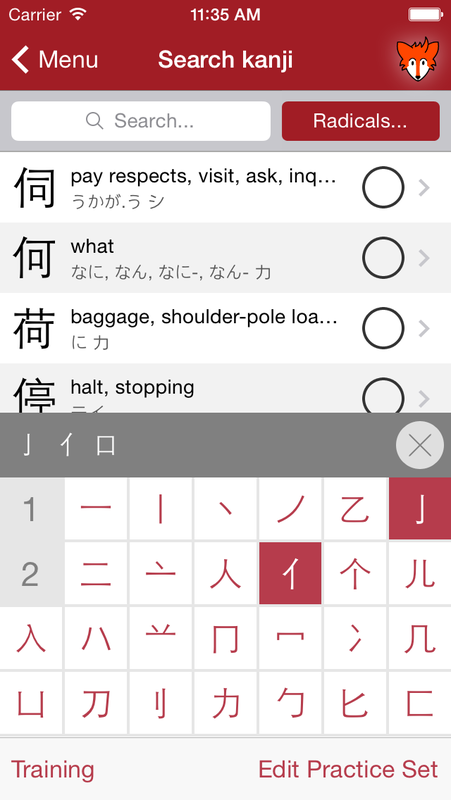 Also new in iKanji touch 2 is the new vocabulary browser. We’ve included 5 sets of vocabulary, one for each JLPT level. You can freely search all the vocabulary for limit your search to the selected set. You can hear any of the words pronounced using your device’s built-in Japanese text-to-speech function. Vocabulary flash cards let you focus on a single word with its meaning, kana reading and classification. It also provides a break down of each kanji in the word to help you understand its meaning. 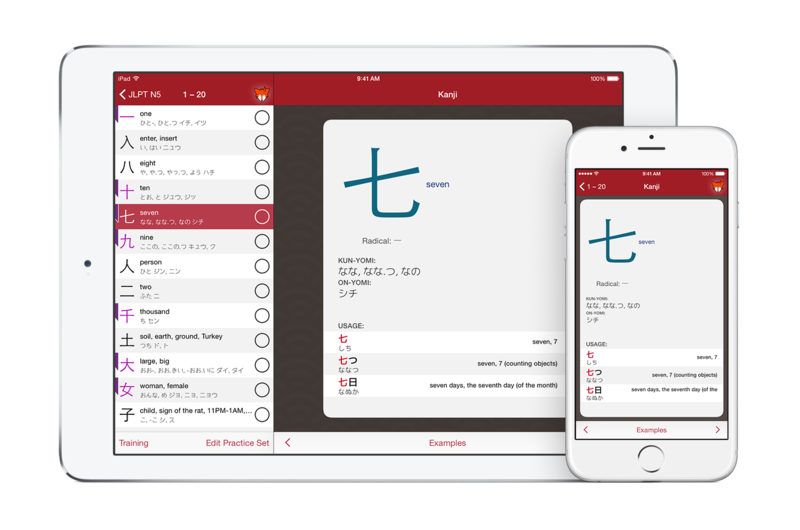 iKanji touch features a spaced repetition training system to help teach you kanji. Based on how you do in the Teach Me mode over time, kanji will be placed into one of 5 groups. Group 1 is kanji you’ve either not tested or keep getting wrong, group 5 is kanji you consistently get right in the tests over a long period of time. As you progress and consistently answer questions about a kanji correctly the testing interval increases from days to weeks to months. Conversely if you have trouble with a kanji it will be tested more frequently. We use a simple visual system with green piecharts to show your progress. The more green you see the better you know a kanji! 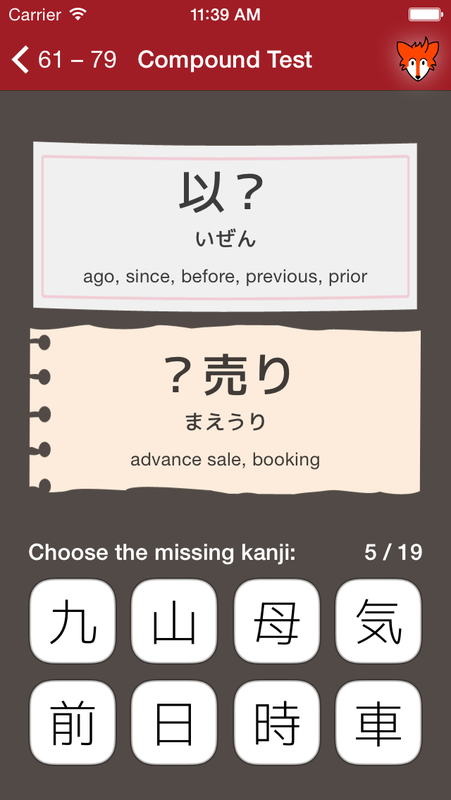 iKanji touch features multiple-choice tests for practicing kanji meanings and readings. These let you freely practice at any time without influencing your overall training progress with the spaced repetition system. 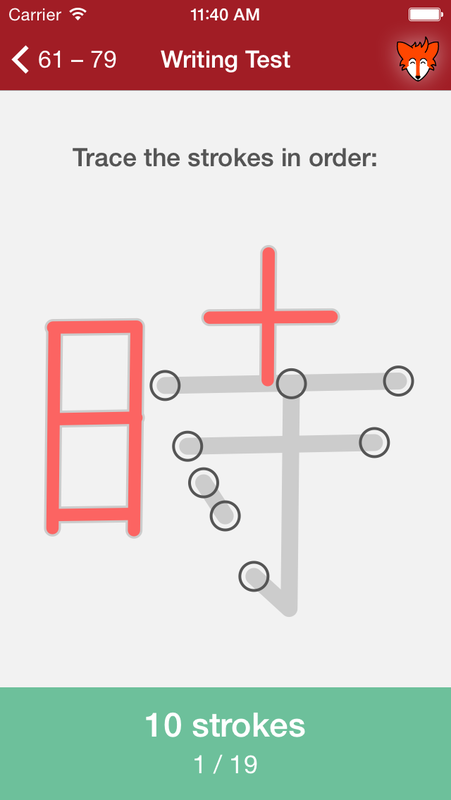 We have an innovative ‘connect the dots’ test to see how well you can remember your kanji stroke order and direction. The compound test lets you answer questions about kanji within the context of words. One character is blanked out and you are given both the English meaning and kana reading as clues to picking the correct kanji from a selection of eight.